I was tagged by the lovely Bea, from Bea's Beauty Blog to do this post what seems like forever ago but only now have I managed to complete it (sorry it's taken so long Bea). I will be tagging 5 more people who then have to carry on the tag, keep reading to find out what beauty products I can and can't live without. 1. Would you rather lose all of your mascaras, eyeliners, lipsticks, and lip glosses or lose all of your palettes and eye shadows? I would rather loose all my palettes and eye shadows simply because compared to mascara and eyeliner they are a luxury, not a necessity. 2. Would you rather chop off all your hair or never be able to cut it again? Definitely without a doubt never be able to cut it again, as you can tell, I'm all about the long hair and always wear extensions. 3. Would you rather have a coral cheek or a pink cheek? I would say a coral cheek as it can be more flattering on darker skin tones. 4. If you had £1000 to spend, would you rather buy clothes or makeup? 100% clothes... I'm a clothes addict and I'm not afraid to show it. 5. Would you rather apply lipstick as eyeliner, or eyeliner as lipstick? What an intriguing thought, probably an eyeliner as a lipstick. It would be similar to a lip liner I guess and I wouldn't have a clue where to start with applying a lipstick as an eyeliner. 6. Would you rather only shop at MAC or Sephora? Unfortunately I haven't had the opportunity to shop in Sephora so going by that, I'd say MAC although I hope to visit Sephora next time I get the opportunity to go to America. 7. Would you rather only use one eyeshadow color or one lip color for the rest of your life? To be perfectly honest, I usually stick to golden neutral tones for the day to day anyway but I love lipsticks, so I'd rather only use one eye shadow. 8. Would you rather wear winter clothes in summer or summer clothes in winter? Living in the UK it's safer to say winter clothes in the summer! 9. Would you rather have dark nails or bright nails all year round? Hmm tough one... probably bright nails all year round. 10. Would you rather give up your favorite lip product or your favorite eye product? I would prefer to give up my favorite eye product because I love my MAC lipsticks far too much. 11. Would you rather only be able to wear your hair in a ponytail or a messy bun? This one doesn't really bother me either way, but i'll go with the messy bun! 12. Would your rather never be able to paint your nails again or never use lipgloss? Lipgloss is something rarely wear but I try to make sure my nails are painted at all times so i'm going to go with never use lipgloss. 13. Would you rather shave your eyebrows and have none at all or sharpie them in everyday? I do like a good strong brow and fill them in everyday, so why not Sharpie them haha. 14. 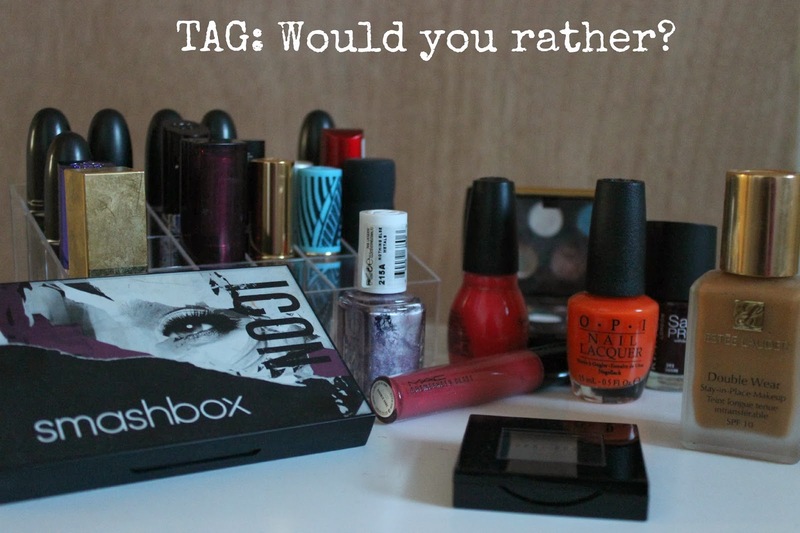 Would you rather live without makeup or nail polish? There's no chance in hell that I'd be able to live with out makeup, my skin is just far too blemish prone and not good enough! so I'd live without nail polish. Sorry if you've already been tagged in this! Hey, thanks for visiting my blog :-) Followed you! Have a lovely day!